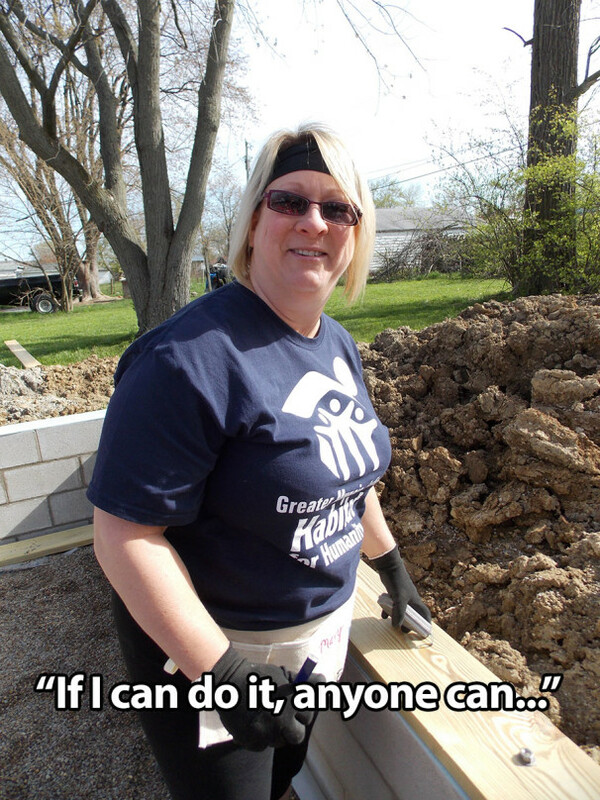 My name is Mary Berry, and I am a Habitat for Humanity volunteer. Before I got involved with Habitat a few years ago, I really had not found the time or a way that worked for me to serve others in the community as a volunteer. I always thought it would be something that would have to wait until after I retired. But a few years ago, I was in a Bible study that posed a challenge for each of us to seek out a way to serve others that was out of our comfort zone. I was a bit overwhelmed trying to figure out just what I could do to meet this challenge. I have always had an interest in Habitat, so I went on the internet to research just how I could get involved. I found the national site, but was able to connect to the local Muncie Habitat’s website and quickly found something that sparked my interest. The website told about an upcoming Women Build project where a house would be built by teams of women. This was just what I was looking for. I e-mailed the local contact and asked “what do I need to do?” I was told that they have Team Captains ~ people to bring a group of 15 to work for a day on the construction site and to fundraise $3,000 toward costs associated with the project. I didn’t really have time to get together a team, so I asked if there were any teams that needed help. I was told there was a community team and that I could join and still participate. That was great! I raised my funds and also brought along a friend to join me. My friend and I showed up at the construction site on our designated day to work. It was cold and rainy, but our spirits were anything but! I’ve always enjoyed doing small DIY projects around the house but had no construction experience or skills to speak of, so I wondered what part I could actually play in building a house. I remember walking up to the work site and feeling welcomed by people who were genuinely glad to see us there. They showed TREMENDOUS patience with me that day…I cut into three sheets of plywood while making a cut with the circular saw. I guess you are supposed to move the sheet to saw horses before cutting! Luckily we were able to salvage the damaged plywood for other uses. After hammering may nails that bent over and over before getting the hang of it, we were able to get a lot accomplished that day on the house. At the end of our day working with Habitat, my new friends and I could stand back and see all that we accomplished – and it truly felt wonderful! When the home was complete, Habitat sent us an invitation to come and see the finished home and to celebrate with Joy, the new homeowner, as she received keys to her new home and a brighter future. It was great to see the completed home and know that I had a part in making Joy’s dream come true. I was also thrilled to learn that Women Build teams raised over $30,000 to cover costs associated with building her home! Well, year two came along and I was just as excited to build again. But this time I really stepped outside my comfort zone and became a Team Captain! I invited my friends to join me, and a few did – each bringing a friend of their own to build our team of 14 strong. We each worked to raise $200, which proved easier than any of us thought. This spring I will participate in my third Women Build project and I hope to volunteer more often with Habitat throughout the year! I’ve come to know so many new friends through my work with Habitat, and I’ve built stronger bonds with old friends, as well. I’m so glad that I didn’t wait until I retire to get involved. If I can do it, anyone can do it!